Update 5/17: Contest is now closed. The nice folks at Wolf Gourmet sent me a toaster. And the toaster is beautiful, if such a thing is possible. Before it arrived, I didn’t give much thought to my old toaster. It had two slots and a dial on the front to set the toasting level. Which boiled down to two settings: barely golden or on the edge of burnt. Sometimes I used a dinner knife to retrieve my toast because as soon as it emerged it would retreat back into the toaster like it was too tired to hold itself up long enough for me to pluck it out. I didn’t think much about any of this until my new toaster arrived. I’m a sucker for red knobs and my new toaster has two. Each controls the level of “toastiness” for two slices of bread each, the thickness of which doesn’t matter because the slots are extra wide. Slot-size was another thing I didn’t think about with my old toaster. I can welcome thick-sliced bagels into my life now. They’ll fit in this new toaster. And so I made a fried egg sandwich with toasted bread, creamy herbed mayo, and crispy bacon. I popped two slices of bread in the toaster set to level “5”. I melted some butter in a pan and once it was hot and frothy, I slid an egg in and watched the edges turn white on contact with the hot butter. The egg snapped and bubbled for a few minutes until I flipped it, careful to not break the yolk, and cooked it a minute or so more. I pressed gently on the yolk, it was encased in a thin layer of white, and it jiggled with a delicate resistance. I transferred the egg to a cutting board and let it rest for a minute. The yolk firmed up enough to hold its shape, like a small water balloon. Meanwhile, my new toaster was set to “warm”, a feature my old toaster didn’t have. My old toaster waited for no one, once the bread was toasted its work was done leaving the toast to go cold while I finished the eggs. This new toaster has a thoughtful warming feature. It understands that breakfast is not always well timed. I slathered herbed mayonnaise on the two pieces of toast. A pile of spinach – the leaves stacked, rolled, and sliced into ribbons – followed by mayo. I placed the egg on the bed of spinach with slices of bacon on top. Another piece of toast finished the sandwich. Holding my breath, I sliced the sandwich in half. As I pulled the slices apart a dribble of thick, golden yolk made its way toward the plate. 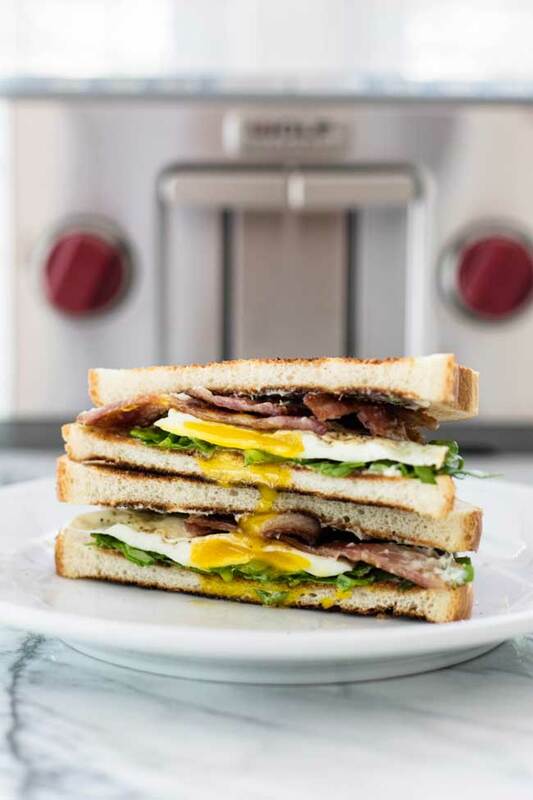 A fried egg sandwich on toasted bread with bacon is perfect for breakfast, lunch, or dinner. Cook the bacon in a small frying pan until crispy. Transfer to a paper towel lined plate. Wipe the the pan to remove the fat, and melt a 1/2 tablespoon of butter in the pan over medium low heat. While the butter is melting, pop the bread in the toaster to toast. Once the butter is melted, add an egg to the pan. Cook the egg for a couple of minutes until the whites are mostly cooked through and opaque. Top the egg with a pinch of salt and pepper. Flip the egg over and cook it another minute or so until the white is cooked through. Transfer the egg to a cutting board or plate and let it sit while you prepare the sandwich. Mix the dill with the mayo and spread it on each slice of toast. Pile the spinach on one slice of toast. Place the egg on top. Top the egg with the bacon and the other piece of toast. Slice and serve. Congratulations to the winner – Amy H.! It’s simple. Leave a comment and let me know what you’ll toast in your new toaster – frozen waffles served with vanilla ice cream on top (<– no shame), or everything bagels with cream cheese and lox? Maybe some avocado toast or strawberry toast? Let me know and your comment earns you a chance to win. Contest closes at 11:59 PM EST Tuesday, May 16 , 2017. One entry per person, please! Comments are moderated, so don’t worry if it doesn’t publish right away, but please be aware that duplicate comments will be deleted. Open to anyone 18 years or older in the 50 United States with a valid US mailing address (no PO boxes). The winner will be randomly selected (via random number generator) on May 17th, 2017 and notified via email, so please be sure to include a valid email address. The winner will have 24 hours to respond and confirm their shipping address otherwise, a new winner will be randomly selected. Stay tuned… winner will be announced next week. This post was originally posted in 2010. The photos, text, and recipe have all been updated. Thanks April for this one. I always make sandwiches for breakfast with new filling every time. But this one was just lovely. Made it in just 15 minutes. A great time saver, when late for office. Thanks for sharing once again! My favorite isnt that tanatalizing…Just a toasted all grain english muffin, and while that is working, heat up some santa fe smoked turkey, place it on the toasted muffin, add some grueyer, and some great hatch green chile…. I would just toast the usual stuff, like bread,, bagels, english muffins, etc. I love toast! I love jam! My big thrill this weekend was going to the opening of the local farmer’s market and picking up a loaf (yes, loaf!) of English muffin bread and a jar of blackberry jam (with seeds). So great with a fresh cup of coffee! Yum, who says breakfast has to be a quick bowl of cereal…this recipe rocks! I would toast large slices of Sour Dough bread, with a homemade burger, bacon, and blue cheese. I love all those flavors! I would get some of those cooking bags that can be used in a toaster then the Camper and I would hit the road. I always have homemade waffles in the freezer, not much for the cardboard variety they sell at the market. I would heat up one and top it with caramelized bananas, walnuts and pure maple syrup! That is a beautiful toaster! And I love your fried egg sandwich pics. They’re making me so hungry. I’d definitely make avocado toast and would also like to try sweet potato toast. Thanks for the opportunity! 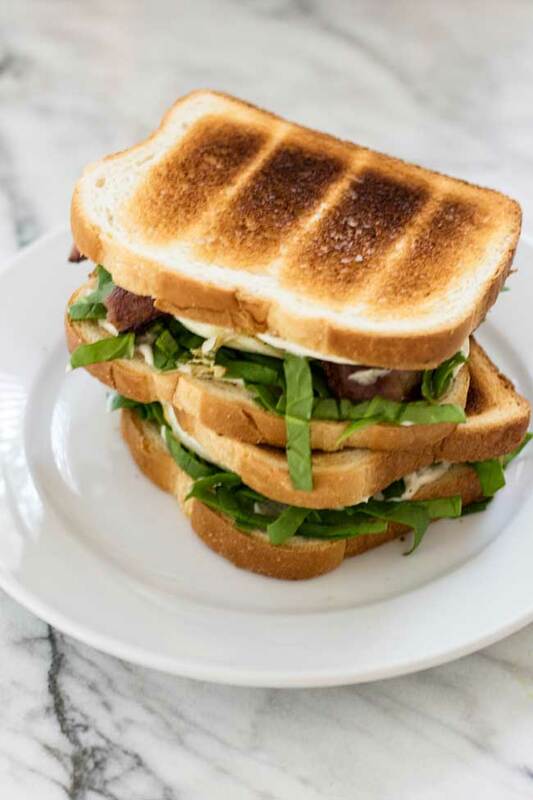 ok first of all YUM this sandwich looks awesome and #2 i would make club sandwiches, and am stealing your herbed mayo and using on my club! This recipe sounds very good! I love almost anything on a nice piece of rye toast, everything bagel or English muffin. I do think my 1st sandwich using this gorgeous toaster would be rye with mayo & liverwurst and thin red onions…like the german deli makes…yummy! I will be making a toasted everything bagel sandwich with cream cheese and chives, topped with ham and egg. I would first try it out on a bagel. I’m feeling like a little comfort food today. I would toast some good old white bread; butter lightly and smother in creamed eggs….then back for seconds. I would toast some whole wheat bread for avocado toast! I’d toast a lot of home-made sourdough and banana bread. I love toast with good butter. First thing would be my whole grain toast for avocado toast. Second would be angel food cake slices for angel s’mores. Know this doesn’t sound too creative but I would make toast. my husband and I eat a piece each morning with peanut butter. Hey gotta have a quick go to! Toast and peanut butter – nothing wrong with that! I would toast blueberry bagels, thanks. I would make a bacon, lettuce and fried green tomato sandwich with pimento cheese. I want to recreate what I had while visiting Charleston this week. I made my first grilled pimento cheese sandwich last week – it was amazing. Love the fried green tomato idea – sounds delicious! I’ll toast up some delicious Boudin sourdough for our BLTs…..yum! It’s been so long since I had toast I’d start by making plain, well brown, crispy toast on thick sliced bread with butter and strawberry preserves. I’d love to use it for bagels topped with avocado and tomato. If you saw my toaster, you would know that I need this. And this will match my Wolf range perfectly (red knobs and all)!! Honestly, now that you’ve tempted with this, if I don’t win, I’m pretty sure I’ll go buy one, because you’ve got me drooling for the toaster and the egg sandwich! I would make the same sandwich you did. Fried egg, bacon, lettuce, and tomato. Yummy ! The Fried Egg Sandwich looks great! 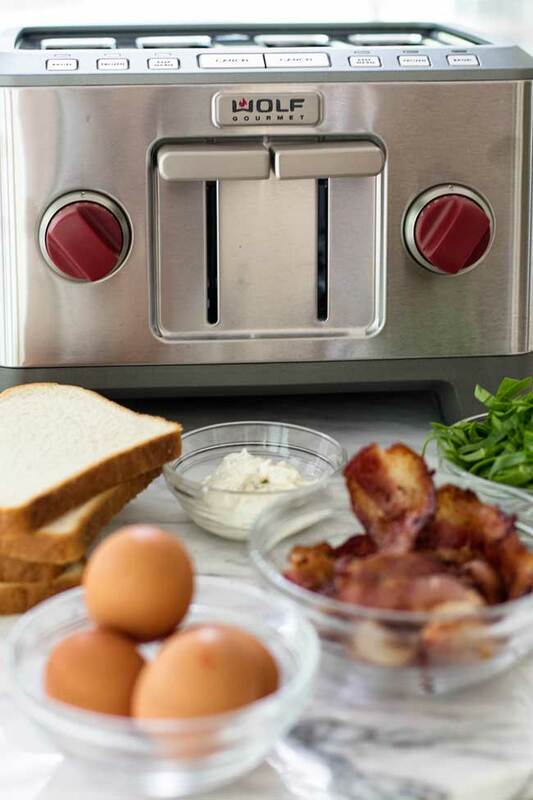 We’ll be using the Wolf Toaster for English Muffins to make Breakfast Sandwiches! Thank you for the opportunity to win this beautiful toaster and thank you for your very inspiring site! I’d toast up some homemade whole wheat toast and smother it with peanut butter and cut up bananas! So yummy! Peanut butter and bananas are a great combo! Toast with mayo and sliced tomatoes for me, Simple and tasty with a little salt and pepper. Yummy sandwich! I would make some chicken and waffles drizzled with maple syrup! We love to eat peanut butter on our toast with honey on the peanut butter. My son eats a lot of toast each day. I’d toast some of my sourdough bread! And it would be amazing, I’m sure 🙂 You have the best bread recipes! Toaster? The bread will be homemade sweet rye with ample butter put on those 2 slabs when it’s toasted. The bottom will start with a thinnest slice of strong, raw onion. That will be followed by a good smear of homemade smoked trout spread. One nice leaf of lettuce will finish it. Put the well buttered top on. I would toast Belgian waffles with fresh berries and honey. We’re big bagel fans in my house! We love everything bagels with cream cheese. Thanks for the chance. Can’t go wrong with everything bagels! This is amazing looking. If I hadn’t eaten my dinner already I would be making that! Oh, I love fried egg sandwiches.. I put mayo and ketchup on mine! Awesome, April! That looks so good!! I have a dish called The Egg Thingy you might like. It isn’t quite as fancy as this, but it really hits the spot. Best sandwich ever! This sounds amazing! Simplecan be delicious. 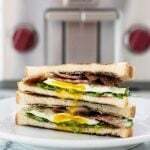 Love how you jazzed up the sandwich without overpowering the fried egg! I want this to be served at every brunch restaurant in NY. Fried egg sandwiches are the best hangover food of all time. I always love to add some hot sauce to my fired egg sandwich yum! This is one of my favorite sandwiches. Love the soft yolk. The photos are gorgeous. I love meals like this. This looks AWESOME. Baking some (hopefully yummy) gluten-free bread, maybe I’ll have this for breakfast tomorrow! Gorgeous photos!! I am lovin’ you bloggy. Your ideas are simple (which I love) with a fresh take and great energy! Thrilled that I found u!! wow this looks almost as delicious as your eggsalad post, hard to choose they are both yummy! This is one of my favorite comfort sandwiches, though love your variation of adding thyme to the mayo. My dad used to make a similar sandwich when I was kid and now I make it for my boys. Delicious! My grandfather never cooked anything except the occasional egg sandwich. Thanks for the memory! Yum! Mmmm egg sandwiches are the BEST! looks great, I always love fried egg in my sandwich. I liked how you chopped the bacon in there. NIce simple sandwiches. Great for breakfast, lunch or dinner. And lovely photos! a lovely simple sandwich. I agree that sometimes fried egg alone feels like there’s something missing. beautiful photos.